Where to Buy Cutrine Plus Granular, Cutrine Plus Granular Algaecide Herbicide - 30 Lb - $97.55 for Sale with Fast Free Shipping! 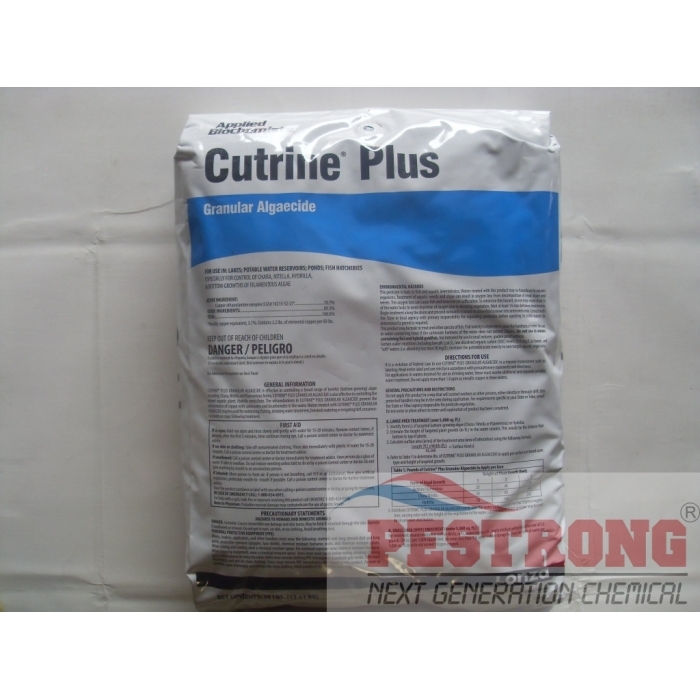 Cutrine Plus Granular Algaecide Herbicide - 30 Lb has no general water use restrictions at label rates for lakes, potable water reservoirs, farm, fish and industrial ponds, fish hatcheries, raceways, crop and non-crop irrigation conveyance system, ditches, canals and laterals. Ideal for bottom growing filamentous algae, Chara and Nitella. Active ingredient is 3.7% copper as elemental (copper-ethanolamine). Application rate is 60 lbs. per surface acre or 1 lb. per 720 square feet (72' x 10'). Cutrine-Plus is for large bodies of water and cannot be used in small ponds containing koi or gold fish. If you want use in small ponds containing koi, use GreenCleen Pro Algaecide/Fungicide.